The Fifth Annual Gala of Hope Fundraiser, an evening of elegance, service and soothing sounds from popular band Party on the Moon, was held 6:30 p.m. Friday, Oct. 23 at the Hampton Roads Convention Center. The event was hosted by Hampton University and President William R. Harvey. Students, faculty, staff and other special guests will join together once more to wine, dine and engage in stimulating conversation about future endeavors and the continuous fight against cancer. Over time, Hampton University's Proton Therapy Institute has provided over 1,200 patients with consistent care for prostate, breast, lung and other cancers. Although treatment numbers have not quite measured up to what was projected, scientists and doctors are continuously researching and working toward finding new ways to cure this disease. "I still have high hopes for it. The baby isn't born full-grown. It's just like any other new business. I'm not discouraged at all," said Harvey told the Daily Press in an Oct. 17 account. Several students have expressed such enthusiasm about The Gala of Hope's impact over the past years and what it will entail Friday evening. "I'm so excited to experience this gala because President Harvey has put so much time and hard work into the proton therapy center and to see 800-plus guests, including my peers, come together to support and celebrate that is a huge and wonderful accomplishment," said Davon Moore of Greenville, N.C. "And just to add, I am excited to see Sister Sledge." As reported in interviews and videos, the university not only joins together for an important cause, but they have fun while doing so with music and other entertainment. Event proceeds will cover the treatments of indigent and child patients, said Harvey at a Tuesday faculty meeting. This illustrious event comes at what some might consider a hefty price. Individual tickets for the Gala of Hope are $250, and $450 for couples. Allie-Ryan Butler, an assistant professor in the Scripps Howard School of Journalism and Communications said, "I don't look at it as I'm paying for the ticket, I look at it as I'm helping change someone's life." The black-tie affair featured a gourmet dinner, dancing and networking, and live music performed by Party on the Moon, which was voted America's No. 1 corporate and private party band and returned this year for a double encore performance. A silent auction will also take place during the gala's festivities. This year's gala fundraiser will also allow cancer conquerors like Shondia McFadden-Sabari to express a sense of pride, belief and joy for an endless battle. "I scared the hell out of cancer so it took my breasts and left," McFadden-Sabari said proudly as she spoke about her journey to student leaders and other university members for Breast Cancer Awareness Month this week. Malik Jones and Tyana Talley contributed to this report. All three writers are students in the Scripps Howard School of Journalism and Communications. 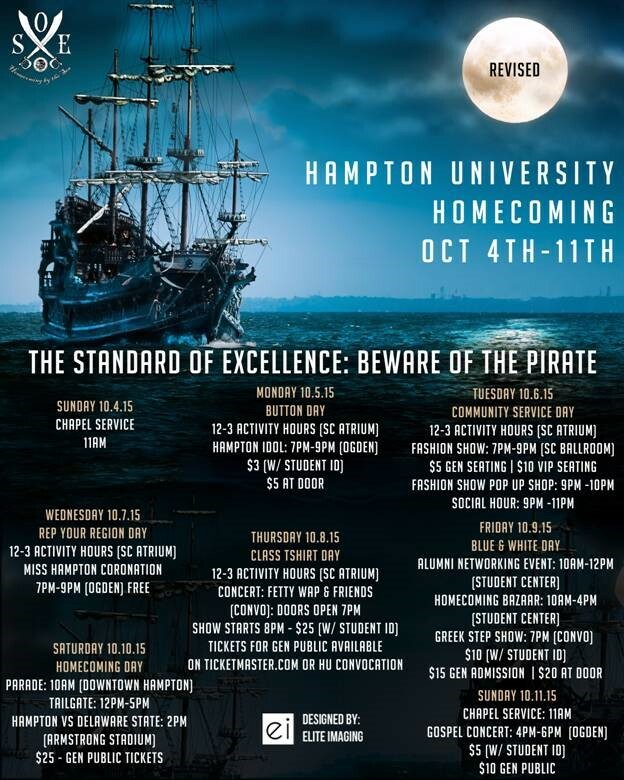 The anticipated Hampton University Homecoming cabaret is here. On Wednesday, Oct. 7, students will pack the Hampton Convention Center to let loose and have a good time. Known to many students as "Que Cab," the annual event hasn't been in Hampton for years. Last year, the venue was at Club VA Live in Chesapeake. In the years before, the semi-formal event was hosted in Portsmouth, Norfolk and other locations. "Our profits were very good. Moving the location closer was more convenient for students who don't have cars," said Raquan Haynes, class of 2016 and an Omega Psi Phi member. In the weeks leading up to Que Cab, the Gamma Epsilon Chapter of Omega Psi Phi Fraternity sold tickets during Hampton's 12 to 2 day social. The first 100 tickets were sold for $10. Once they were gone, the price went to $15 and up again. Hundreds of tickets were sold to the student body over the course of the last week. This year's venue will not have an open bar. In the previous years, there has always been a bar to accompany the party for students with the proper identification. "I guess it's better that the location is closer, but there's no bar," said, Thomas Wood, Omega Psi Phi member and '08 alum. "In 2009, there wasn't a bar, but there were bars afterwards." The Omega Psi Phi Que Cab will begin at 9 p.m. and end at 1 a.m. It will be held in Ballroom E-G at the Convention Center. Jeans, sweats and white T-shirts are not permitted. The cabaret allows students to step out and enjoy a night out on a school night. Ladies, grab your little black dresses and heels. Men, wear your dress slacks and button-up collar shirts. Tonight will be a night to remember. The event hasn't sold out of tickets, but you must contact an Omega Psi Phi Fraternity member directly if you're interested in purchasing tickets. As most of us were aware of Hurricane Joaquin possibly approaching Virginia, Hampton University students and administration experienced multiple mishaps out of their immediate control. Since before fall semester began, the office of student activities staff and student leaders prepared for families to arrive for the annual Parents Weekend Oct. 2-3. After a meeting with higher-ups on Thursday afternoon, it was confirmed and announced that all festivities for the weekend had been postponed. "As a co-director, I was really looking forward to Parents Weekend because I wanted parents to have the best time ever with their students," said Aliah Williamson, a broadcast journalism major from California. "This Parents Weekend was going to be very different from past years so it was a little disappointing when it got cancelled, but I would rather parents be safe. "If it gets rescheduled, we will be ready." For some parents, this only meant unloading a car for a short-distance drive to campus, but for others, money may have been wasted on a nonrefundable round trip. "Don't get me wrong, I do enjoy coming to visit my daughter," said mother Patrice Hector of Atlanta, "but because I am an entrepreneur, these trips conflict with my weekend income in the hair salon. But then again, I, nor Hampton have control over the acts of God, so at the end of the day, safety is first and there are no fingers to point on my end." 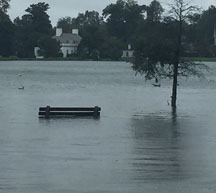 Beyond cancellation of weekend activities leading into Homecoming week, students have experienced quite a few flooding troubles in parking lots and other areas surrounding their dorms. "This weekend has been a great inconvenience to me, in regards to living at Holmes Hall," said Randolph Scott Jr. of Chicago, a fourth-year, five-year MBA major. "Due to the unequal dimensions of the ground, it floods horribly in the front. This makes it extremely difficult for my colleagues and I to even enter the building." According to social media, other students tended to follow the saying, "find the laugh in everything," by creating short and humorous videos. Some pretended to be reporters capturing live footage from the flooded scene, while others made sarcastic comments. "When they say Hampton is your home by the sea, who would literally think you would actually walk outside looking for a safety boat to get to class? said Nadera Harris, a second-year RA in White Hall. "I feel like all students earned a position on Hampton's non-existent elite swim team thanks to Hurricane Joaquin this weekend."